Dimensions: 5-1/4 x 2-3/4 x 1-1/3 in. 330 pages. Ever since humans could recognize the scarcity of shiny objects, gold has been the very symbol of value and worth. 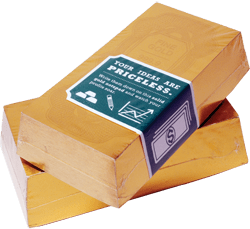 The Gold Standard Noteblock contains over 300 sheets, perfect for the most valuable messages. When money's the object, here's the desk accessory for the friend who has everything.